Winchester College Chapel Choir sings the regular services in Winchester College Chapel. Winchester College was founded by William of Wykeham, Bishop of Winchester, in 1382, and Winchester College Quiristers have for over 625 years sung services in Winchester College Chapel. In modern times they have formed a choir renowned for its excellence, and their musical director is Malcolm Archer. The Quiristers, who form the top line of the choir, perform a wide variety of music at home and abroad. They benefit from bursaries, a first rate all-round education, and a particularly broad musical training. This builds confidence, teamwork and a commitment to the highest standards. The Quiristers also sing on their own as a concert choir, as well as with Winchester College Chapel Choir. The senior boys from the College, many with previous experience as both choristers and Quiristers, provide the lower voices. Since 1966 the Quiristers have attended The Pilgrims’ School. They are given bursaries which are funded by Winchester College, and means tested top up funding is available up to 100 per cent. At Pilgrims’ the Quiristers benefit from the best academic teaching and join in all the school’s sporting activities. 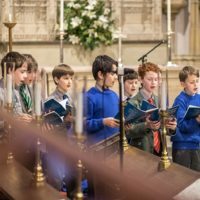 Winchester College Chapel Choir broadcasts, records and goes on tour, and in recent years they have sung in the USA, Italy, France, Holland, Russia and Germany. In the Quiristers’ own concerts they perform a fascinating mix of both sacred and secular repertoire. The Chapel Choir regularly sings in London, where performances have included the BBC Promenade Concerts and The London Handel Festival. They have also performed Bach’s St John Passion with the Academy of Ancient Music. They recently sang for a special 70th birthday concert for the composer John Rutter. The frequently appear on BBC TV and Radio. Appearances have included the BBC Radio 3 ‘Choral Evensong’ programme and Classic FM. In 2015 a Quirister won the coveted BBC Young Chorister of the Year competition, and it is noteworthy that his was the fourth such success in recent years. The Chapel Choir has regularly broadcast the Classic FM carol service and the Quiristers have recorded Britten’s A Ceremony of Carols for BBC Radio 4. The Chapel Choir is proud of its association with Convivium Records. Their releases have included Stanford’s Choral Music and Britten’s A Ceremony of Carols. The also recorded Mozart’s Requiem with the London Mozart Players. The choir has also recorded a disc of plainsong for Warner Classics in association with film and TV composer David Perry. For boys with musical gifts, our musical training offers a unique opportunity. All our boys learn two instruments, with practice timetabled and supervised. As a result, many win scholarships (academic and musical) to a range of secondary schools, including Winchester College. Many former Quiristers and Chapel Choir members have gone on to take up Oxbridge choral and organ scholarships and won places at our top musical conservatoires.